Happy half birthday to tabletonic.com.au! 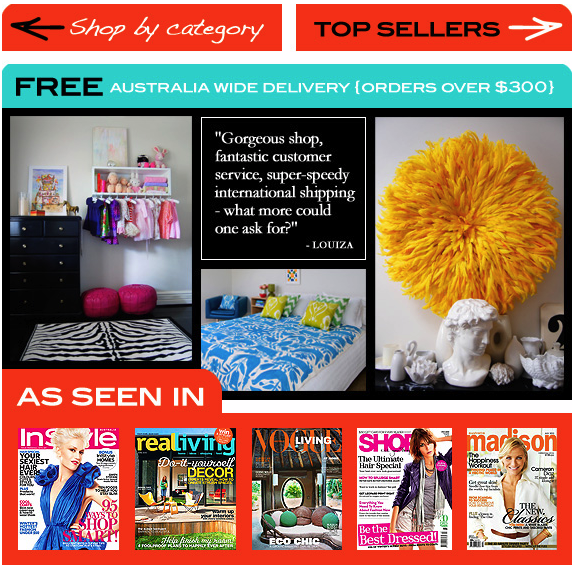 6 months ago today, I nervously opened the virtual doors to tabletonic.com.au, my online store and the purveyer of all things colourful, tribal, handmade and eclectic, or as my tagline suggests, "Global treasures for the modern bohemian". It's been a whirlwind and a blur, and I wouldn't have it any other way! To all of my customers, an enormous thank you for your support (and fine taste! ), and special mention to my definitely excellent friend, Mrs Woog, who was tabletonic.com.au's very first customer. PS Don't forget to follow Table Tonic on Twitter, for store/blog updates and cool-website-alerts aplenty. 1. Where are you based? Sydney. 3. Do you deliver internationally? Yes. 4. Can I return something if it's not right for a full refund? Hell yes. 5. How long does delivery take? 1-2 working days (within Australia), longer for international destinations. Congratulations Louise! You've done so well in such a short time. YAYAYAYS! You are awesome. Congrats Mrs Bell on being such a superstar! Happy half birthday Table Tonic! Congrats!! Here's to many more anniversaries! Congratulations Louise. What a great achievement. Happy half birthday Table Tonic!! Good going Louise! You should be proud! Good onyer! Table Tonic has the feel of something much more established than just 6 months. What a lot you've achieved in what a short time. I'm hanging out to discover where and what you've moved to. (I *think* you were in Balmain, where I'm *thinking* of moving to - if I'm right, would you recommend it?). Now when you're ready to open your Denver, Colorado satellite store, you just give me a call. Congratulations Louise and Table Tonic !! I eagerly anticipate what's in store in the future for you and your clients. I have found much pleasure in your blog and absolutely adore "all my treasures" that I have purchased from you. Congratulations Table Tonic! It's great to see your developments over time. You rock girl!! !